Bunko is now also used in names for museums. in his little box . 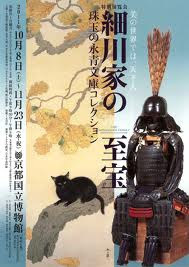 . .
is a private museum located in Kanazawa Ward, Yokohama, Japan. This museum features a private collection of traditional Japanese and Chinese art objects, which is made accessible to the general public. The Kanazawa Bunko was originally a library, which it still is today primarily, but its collection also includes Japanese and Chinese art objects. It was one of the two most important centers of learning in medieval Japan, with Ashikaga Gakkō being the other. 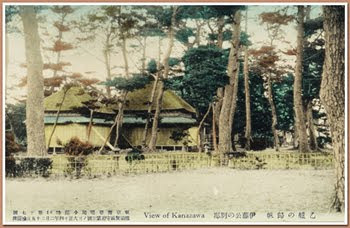 The library was opened in 1275 by Hōjō Sanetoki (1224-76), a grandson of Hōjō Yoshitoki, second regent of the Kamakura shogunate. The art collection of the Kanazawa Bunko includes Kamakura portraits, calligraphy, Chinese and Japanese classics, Buddhist sutras, and Zen writings. It is housed in a building in the precincts of the temple Shōmyōji, though in a new building. The collection includes an eleven-headed Kannon (Goddess of Mercy), a Miroku, and other images designated as Important Cultural Properties. Hosokawa Yusai was the only samurai who asked for an armistice, in the middle of battle, to save an irreplaceable commentary and his poetry collection. Yusai, also known as Fujitaka, was not only a respected daimyo, but also a respected poet and the only living person at that time who was in possession of the hand-written poetry commentary and concordance to decipher the 600 year-old Collection of Poems Ancient and Modern (Kokinshu). It may be hard to believe how much Yusai's generals and Ishida's generals were concerned about the commentary with secret teachings for the first imperial anthology of waka poetry. According to Museum Director Takeuchi Jun'ichi in his foreword to the Lords of the Samurai: The Legacy of a Daimyo Family: "In the midst of defending the castle, Yusai negotiated to have a portion of the Kokinshu denju [commentary] send with his poetry collection to [Prince Tomohito], by way of a specially dispatched 'armistice envoy'." Soon the prince handed the commentary to the emperor. It was most likely that these valuable possessions of the commentary, 21 hand-written imperial anthologies and a copy of The Tale of Genji were carried by oxen for the trip from the castle to the emperor in Kyoto and that a bodyguard of samurai accompanied them. Next, the emperor asked Yusai to surrender his castle, but he refused. 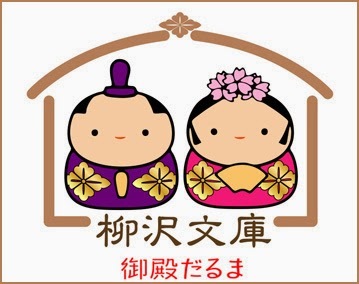 At the end of this incident, the emperor issued an edit for peace and the battle at Tanabe Castle ended. This exhibition presents selected works that embody the history of this prestigious family. Among the ruling class of Japan, the Hosokawa clan held its own in the realm of art. We hope you will enjoy the full scope of this collection’s allure through this exhibition. The Eisei-Bunko Museum (Bunkyo-ku, Tokyo) which preserves and exhibits the legacy of the cultural treasures of the Hosokawa Family, lords of the former Kumamoto domain, produced an application for iPad “Samurai Art - The Hosokawa Family Eisei Bunko Collection” with cooperation of CROSS BORDERS Inc. Japanese edition has been released on December 4, 2010, followed by English and French edition on May 18, 2011 on Apple App Store. Japanese edition recorded third place in App Store download ranking at the best. “Samurai Art - The Hosokawa Family Eisei Bunko Collection” serially introduces historically precious assets of Hosokawa Family including 8 national treasures and 31 important cultural properties with high digital image quality. a Japanese samurai of the Edo period. He was an official in the Tokugawa shogunate and he was a favorite of the fifth shogun, Tokugawa Tsunayoshi. He served Tsunayoshi from an early age, becoming his wakashu and eventually rose to the position of soba yōnin. He was the daimyo of the Kawagoe han, and later of the Kofu han; he retired in 1709.
. Goten 御殿 palace, mansion palatial residence .
. Shogun Tokugawa Tsunayoshi 徳川綱吉 . 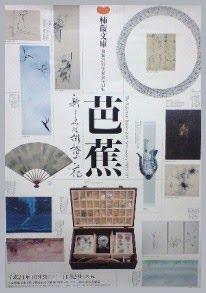 three major collections of haiku poetry and painting. It was founded in November 1984.The collection itself was assembled by the late Professor Rihei Okada(1892-1982),an honorary citizen of Itami and authority on Japanese classical literature. The museum -library is located at 2-chome Miyanomae,in the center of Itami.Occupying 851 square meters,it is designed to look like a Sake( Japanese rice wine ) distillery. "Kakimori," in Japanese,means Gurdian of Persimmon Tree. Professor Okada, who assembled the collection,lived in an old house inherited from ancestors who twenty-three generations had made sake.In his garden a persimmon tree which is over 350 years old is well known in Japan,because the famous poet,Rai San-yo once visited Itami,tasted fruit from the tree,and left a poem to honor the delicious persimmons. The Kakimori Collection includes about 3500 books of haikai and haiku and about 3500 original writings and paintings by Basho, Buson, Onitsura,and others. It covers four centuries of haiku history from medieval times to the modern day, incruding excellent examples by Rai San-yo and others men of letters who visited Itami. The collection is a unique and invaluable treasure of both Japanese art and literature. Wataya Bunko 綿屋文庫 of Tenri Library. This temple was founded in 1691 by 覚彦浄厳律師 Kakugen Jogon (1639 - 1702), who was a protegee of the influential Shogunate advisor, 柳沢吉保 Yanagizawa Yoshiyasu.